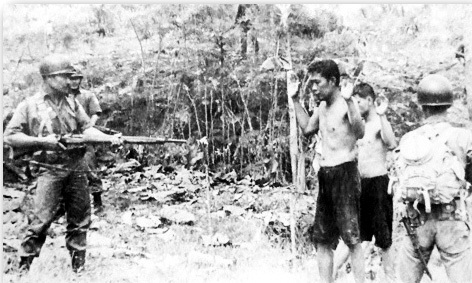 Backlands army units are reported to have executed thousands of Communists after interrogation in remote jails…Armed with wide-blade knives called parangs, Moslem bands crept at night into the homes of Communists, killing entire families and burying the bodies in shallow graves…The murder campaign became so brazen in part of rural East Java that Moslem bands placed the heads of victims on poles and paraded them through villages. The killings have been on such a scale that the disposal of the corpses has created a serious sanitation problem in East Java and Northern Sumatra, where the humid air bears the reek of decayed flesh. Travelers from these areas tell of small rivers and streams that have been literally clogged with bodies; river transportation has at places been seriously impeded. — Time Magazine, December 17, 1965. Cited in David Ransom, “Ford Country: Building an Elite for Indonesia,” reprinted in The Trojan Horse: A Radical Look at Foreign Aid, ed. Steve Weissman, 1975. http://www.cia-on-campus.org/internat/indo%5B2%5D John Roosa, Pretext for Mass Murder: The September 30th Movement and Suharto’s Coup d’Etat in Indonesia, 2006, p. 26. 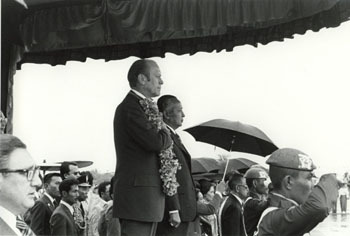 After the independence from Portuguese colonialism, East Timor was invaded by the anti-communist regime of Indonesian General Suharto, on orders of American and Australian imperialism and with the support of Soviet and Chinese social-imperialism (the seas of Timor are immensely rich in oil). 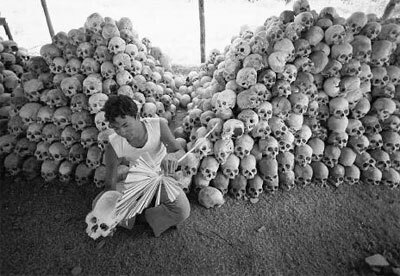 During the Indonesian invasion of Timor, Suharto’s reign of terror eliminated one-third of the entire population (from 600.000 to 400.000 inhabitants, according to bourgeois sources) in what amounts to one of the proportionally greatest and harsh genocides in human history. The US supplied 90% of the weapons. Britain supplied armoured cars and advanced fighter-bombers used against East Timorese targets. The result was the death of 200,000 people out of a total of 700,000 – one of the worst genocides in history by proportion of population killed. “in terms of the bilateral relations between the US and Indonesia, we are more or less condoning the incursion into East Timor… The United States wants to keep its relations with Indonesia close and friendly. We regard Indonesia as a friendly, non-aligned nation – a nation we do a lot of business with”. (The Australian, January 22, 1976. At 2 p.m., 59 men, both Chinese and Timorese, were brought on to the wharf … These men were shot one by one, with the crowd, believed amounting to 500, being ordered to count. The victims were ordered to stand on the edge of the pier facing the sea, so that when they were shot their bodies fell into the water. Indonesian soldiers stood by and fired at the bodies in the water in the event that there was any sign of life. At about 12 noon, the green berets began to land. … They advanced to where I was. They ordered us all out of our homes, to gather in the street. We were taken to an open space, women, children, old people and men, including me. … There were about fifty of us then, all men, just picked up at random. All able-bodied men. … Then the soldiers, there were three of them, started spraying us with bullets. Many died on the spot, some managed to run off, falling as they fled because they had been hit. As far as I know, only 3 or 4 out of the 50 men are still alive. 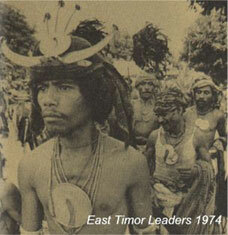 East Timor: Nationalism and Colonialism (University of Queensland Press, 1978) that “in late 1976, letters smuggled via [the West Timorese town of] Kupang reached relatives in Darwin [Australia], listing whole families killed during the invasion. … [One letter] said that many of the inhabitants of Dili had fled to the mountains before the invasion but that of those remaining 80% of the men were killed by Indonesian troops” (p. 279). In the pursuit of realpolitik, U.S. administration after administration, fully aware of his many crimes, provided military assistance and hardware, training and equipping Suharto’s killers. 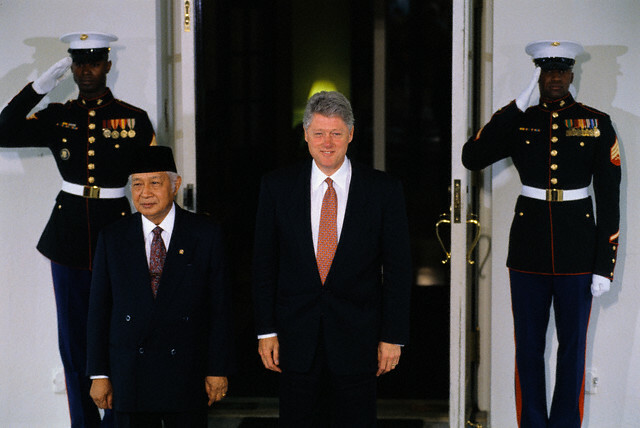 The Indonesian dictator sought and received U.S. approval before he launched his invasion of East Timor; ninety percent of the weapons used in this illegal attack came from the U.S.
To overcome Suharto’s legacy and to uphold basic international human rights and legal principles, those who executed, aided and abetted, and benefited from his criminal orders must be held accountable. The U.S. must undergo a complete accounting for its role in backing the dictator. As a start, the U.S. government must support for an international tribunal to prosecute human rights and war crimes committed in East Timor from 1975 to 1999, and Washington should condition military assistance to Indonesia “on progress towards full democratisation, the subordination of the military to the rule of law and civilian government, and strict adherence with international human rights” as recommended by East Timor’s Commission for Reception, Truth and Reconciliation. 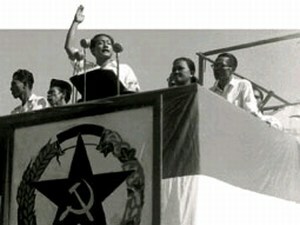 Communist Party of Indonesia (PKI) speech – 3 million strong, before it was massacred by Suharto it was the largest non-ruling Communist party in the world. 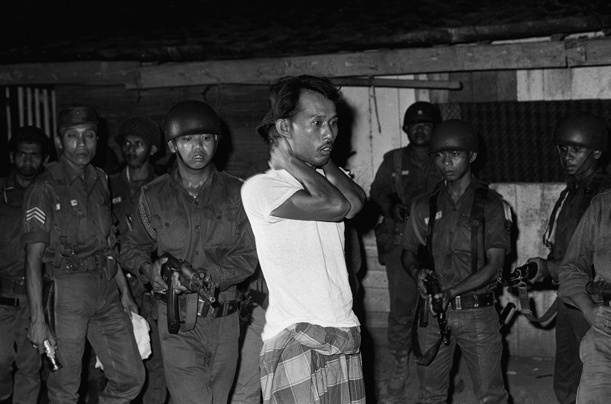 The 1965-6 massacres that accompanied Suharto’s rise to power claimed the lives of between 500,000 and 1 million people, mostly landless peasants. A 1977 Amnesty International report cited a tally of “many more than one million” deaths. In the words of a leaked CIA report at the time, the massacre was “one of the worst mass murders of the 20th century”. (Declassified US CIA Directorate of Intelligence research study, ‘Indonesia – 1965: The Coup That Backfired,’ 1968. “The CIA forged a document purporting to reveal a leftist plot to murder Chilean military leaders… [just like] what happened in Indonesia in 1965.” (John Pilger, ‘Our model dictator,’ The Guardian, January 28, 2007. 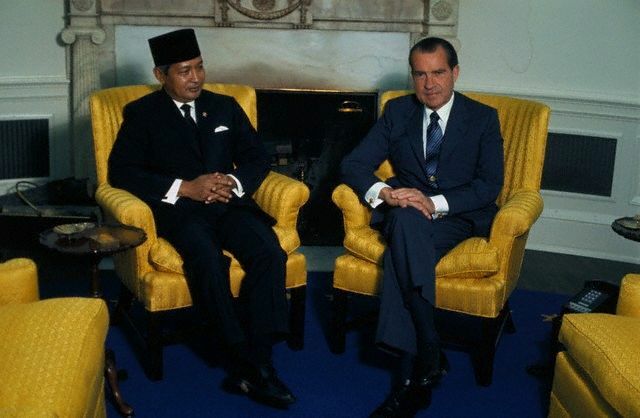 The “deal” involved opening up what Richard Nixon had called “the richest hoard of natural resources, the greatest prize in south-east Asia”. 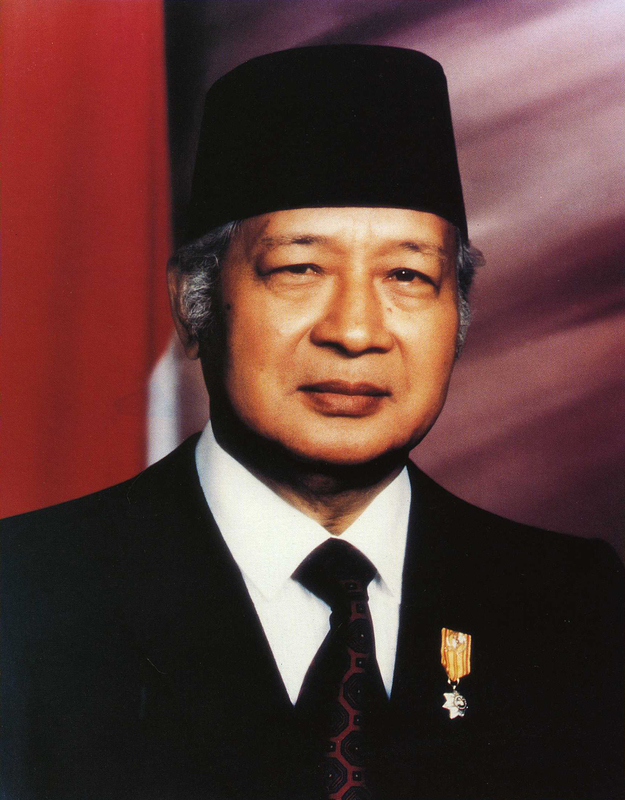 Suharto transformed Indonesia into an “investors’ paradise”. Foreign investment was attracted by a law which protected property from nationalisation for 30 years. The new regime also offered to return to their original owners American, British and Dutch firms which had been taken over by Suharto’s predecessor, Sukarno. In November 1967, Nixon’s “prize” was delivered at a three-day conference in Geneva. The Freeport company got West Papua’s copper. A US/European consortium got much of the nickel. The Alcoa company got Indonesia’s bauxite. America, Japanese and French companies got the tropical forests of Sumatra. The West, unsurprisingly, was delighted to do business with Indonesia’s new “moderate” leader, who was “at heart benign,” the Economist declared. JAKARTA, Indonesia — To millions, Suharto, the military strongman who ruled Indonesia for 32 years, was a tyrant, a thief and a murderer. But more than 12 years after his fall from power in a popular uprising, and two years after his death at age 86, an effort is under way to redefine his legacy: as a national hero. How so? The Indonesian dictator’s rule is no less autocratic than Saddam Hussein’s. 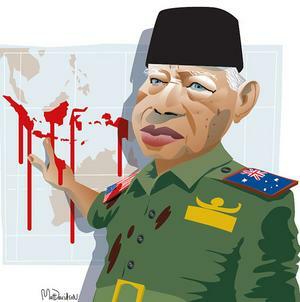 Like Hussein, Suharto has attempted to annex a smaller neighbor–in fact, his ongoing occupation of East Timor has been far bloodier than Hussein’s assault on Kuwait. While Hussein’s rule has been brutally repressive, Suharto is directly responsible for one of the greatest acts of mass murder in post-World War II history: the genocide that accompanied his rise to power in 1965…. 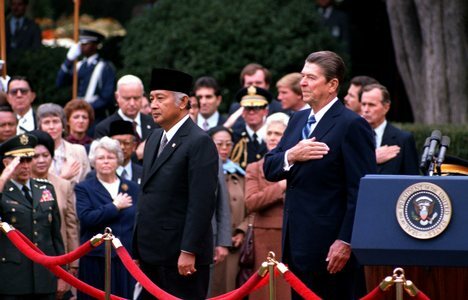 In the months of his exit, he was referred to as Indonesia’s “soft-spoken, enigmatic president” (USA Today, 5/14/98), a “profoundly spiritual man” (New York Times, 5/17/98), a “reforming autocrat” (New York Times, 5/22/98). His motives were benign: “It was not simply personal ambition that led Mr. Suharto to clamp down so hard for so long; it was a fear, shared by many in this country of 210 million people, of chaos” (New York Times, 6/2/98); he “failed to comprehend the intensity of his people’s discontent” (New York Times, 5/21/98), otherwise he undoubtedly would have stepped down earlier. He was sometimes described as “authoritarian,” occasionally as a “dictator,” but never as a mass murderer. 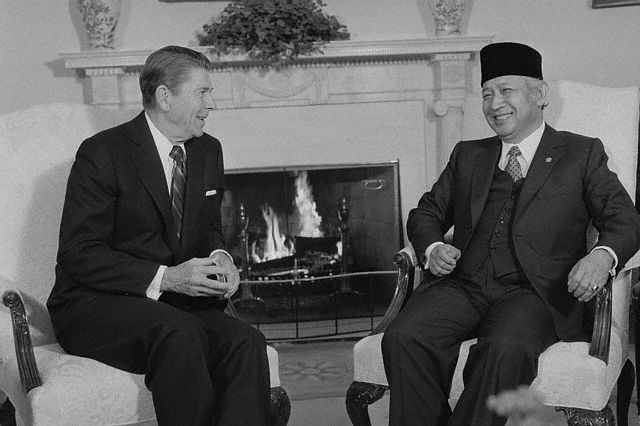 Suharto’s mass killings were referred to–if at all–in a brief and antiseptic paragraph. 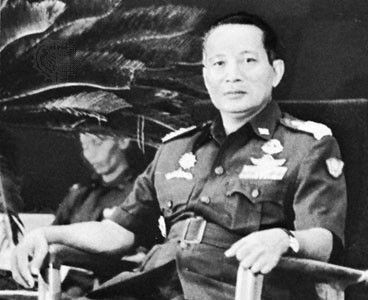 It is interesting to see how the same reporters move between Pol Pot and Suharto, indignant at the former’s killings, somehow unconcerned by the killings of the good genocidist. 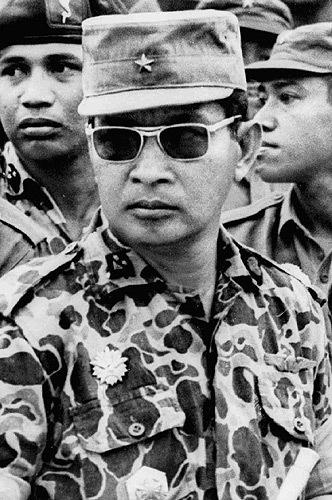 Seth Mydans, the New York Times principal reporter on the two leaders during the past two years, called Pol Pot (4/19/98) “one of the century’s great mass killers…who drove Cambodia to ruin, causing the deaths of more than a million people,” and who “launched one of the world’s most terrifying attempts at utopia” (4/13/98). But in reference to Suharto, this same Mydans (4/8/98) said that “more than 500,000 Indonesians are estimated to have died in a purge of leftists in 1965, the year Mr. Suharto came to power.” Note that Suharto is not even the killer, let alone a “great mass killer,” and this “purge”–not “murder” or “slaughter”–was not “terrifying,” and was not allocated to any particular agent. The use of the passive voice is common in dealing with Suharto’s victims: They “died” instead of being killed (“the violence left a reported 500,000 people dead”–New York Times, 1/15/98), or “were killed” without reference to the author of the killings (e.g., Washington Post, 2/23/98, 5/26/98). 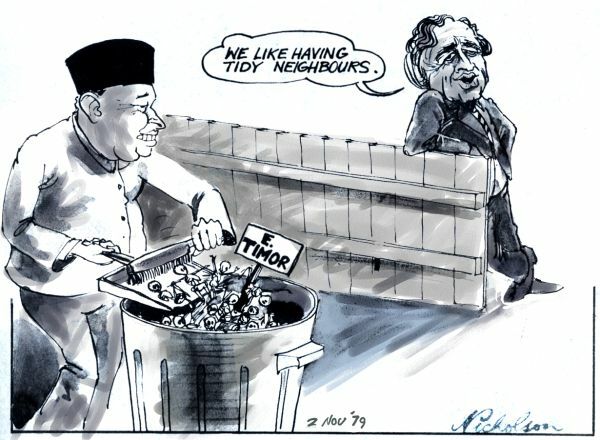 In referring to East Timor, Mydans (New York Times, 7/28/96) spoke of protesters shouting grievances about “the suppression of opposition in East Timor and Irian Jaya.” Is “suppression of opposition” the proper description of an invasion and occupation that eliminated 200,000 out of 700,000 people? Some Indonesians view Suharto as a hero? Maybe they’re longtime readers of the New York Times. 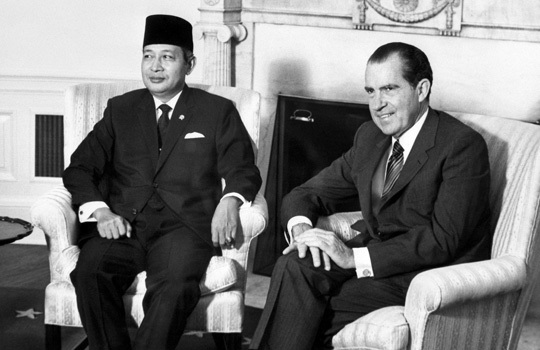 A complex series of events, involving a supposed coup attempt, a counter-coup, and perhaps a counter-counter-coup, with American fingerprints apparent at various points, resulted in the ouster from power of Sukarno and his replacement by a military coup led by General Suharto. The massacre that began immediately — of Communists, Communist sympathizers, suspected Communists, suspected Communist sympathizers, and none of the above — was called by the New York Times “one of the most savage mass slayings of modern political history.” The estimates of the number killed in the course of a few years begin at half a million and go above a million. It was later learned that the U.S. embassy had compiled lists of “Communist” operatives, from top echelons down to village cadres, as many as 5,000 names, and turned them over to the army, which then hunted those persons down and killed them. The Americans would then check off the names of those who had been killed or captured. Added note: To this day, Indonesia’s military and police forces continue to be one of America’s best customers for weapons, training, and torture devices. 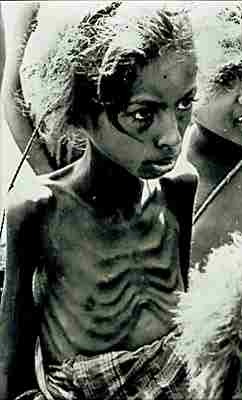 Starving East Timorese children in Laga, East Timor. 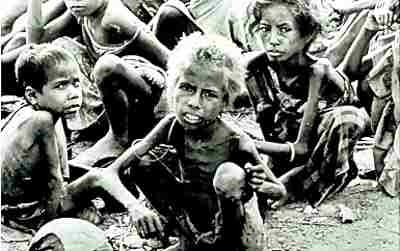 The famine in East Timor, while largely unnoticed by the world, has been described as “as bad as Biafra” by the International Red Cross. Starvation became widespread in 1979 as communities, subjected to bombardment in the mountains, were unable to grow food supplies. 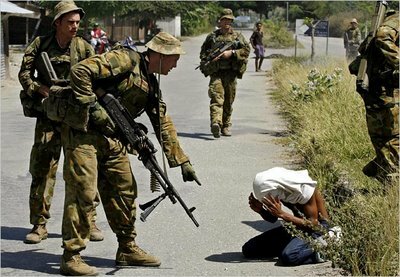 These photos were published on the front page of “The Sydney Morning Herald” at the time, subsequently causing a storm of criticism from Indonesia. As of 2001, 12.4% of the children in East Timor die before reaching the age of five. 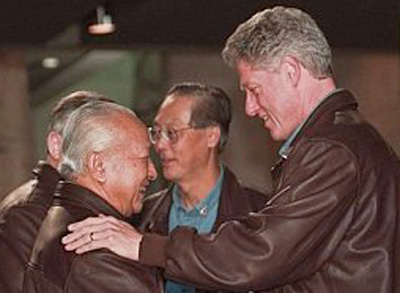 Suharto died at age 86 in January, 2008. He and his generals were never tried for any of their crimes.